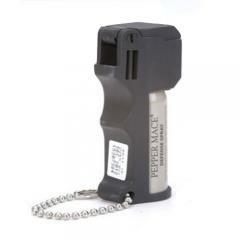 The Pepper Mace Pocket Model is an extremely compact self defense spray that is legal to carry in all 50 states. Its small size and molded finger grips provide a comfortable fit for most women's hands, making it easier to aim or keep hold of during a struggle. With a maximum range of 12 feet, it allows you to engage your assailant at a safe distance, and its powerful pepper formula causes intense burning that will subdue even the most determined attacker. Each canister contains 11 grams of formula, enough for five one-second bursts. Mark 8 Personal Keychain Pepper Spray Unit 11gr.